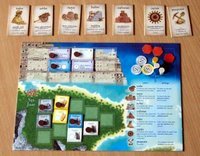 I like Puerto Rico, giving it 7.5 on BGG. But I've always wondered why I don't like it more. This has nothing to do with it being ranked #1. PR seems to be the kind of game that I would rate higher. Today I finally stumbled onto the answer, and it has led me to this topic. I like all kinds of games. For me, "fun" is not a single definition, but an entire spectrum: serious fun to silly fun. I enjoy games where I have to stare at the board and think ahead 10 moves, and I also enjoy games where the "goal" is to laugh at each other. I'll illustrate the extremes using Go and Apples to Apples. Go is luckless, cold, calculating, deep, rich, yet intuitive. You would rarely find players laughing during a game, or even smiling. I find it intensely fun: the challenge, the experimentation, the review, the study. Apples to Apples is full of luck, warm and fuzzy, shallow, yet you can have a blast by picking cards almost at random. 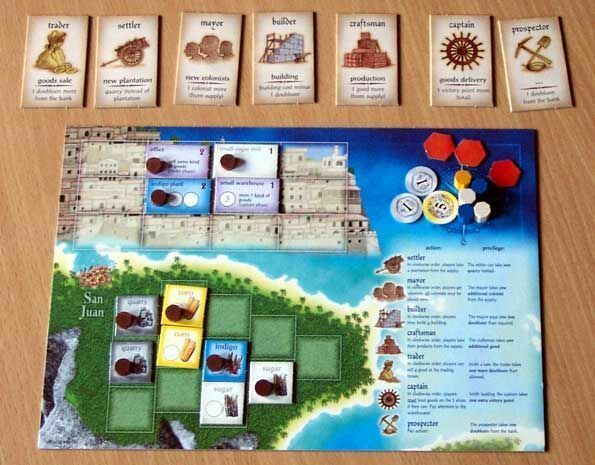 Here's the catch: the game mechanics must match the type of fun the game inspires. Complex games should be serious fun, and simple games should be silly fun. For me, Puerto Rico seems like a lighter game. There are only 7 roles, and on your turn there are usually fewer to choose from. When you get to take your action based on the current role, there are few choices, and sometimes none. Add to this the volatility of the game, and you get something that deserves a much lighter treatment. I would never spend more than 5 seconds deciding which card to choose in Apples to Apples. I'm not saying PR feels like a party game, but the mechanics are not on the serious end of the spectrum either. Yet it doesn't feel that serious of a game to me. A mismatch. Pirate's Cove is the opposite. It has a light theme, but the mechanics are too heavy, despite the game being too random. In what games does this phenomenon occur for you? Hey I just started a blog like october. 2nd called anything goes blog. PLEASE TELL ANYBODY ABOUT IT!!! I'M LOOKING FOR COMMENTS! Wow Gabe - so happy to hear...lovely. Pregame - Wow this is a great new mechanic...everything I do affects everyone else - therefore I have to anticiapte and rally be careful about what i do. Really cool. I think both of those experiences are accurate for some people...and I expect the more serious gamers are stuck in world B where they feel like the first 2 rounds of every game are formality and the game is overthought - they rate the game a 7. The majority of gamerslive in world A where they find only World A players to play with so the game can be fun and silly without requiring too much thought. They rate the game a 10 because it is at their personal "amount I will think while playing a game" pinnacle. Frank's Zoo looks like a light fun game, but it's best played like a serious game. I actually prefer it played a little bit less seriously even though it deserves more respect.